As the New York Yankees look to upgrade their roster at the 2018 MLB winter meetings, American League Rookie of the Year runner-up Miguel Andujar is not considered to be untouchable. The Athletic's Ken Rosenthal and Robert Murray reported Tuesday the Yankees are open to dealing Andujar. New York had previously been reluctant to include the 23-year-old in trade talks. But given the team's interest in All-Star infielder Manny Machado, their tune appears to have changed, though that's not necessarily an indictment on Andujar. In his first real taste of the big leagues, Andujar hit .297/.328/.527 with 27 home runs, 47 doubles and 92 RBI. The right-handed slugger put up a .309 average against right-handers, recording 20 home runs and 31 doubles in such matchups. Back in July, Joel Sherman of the New York Post reported the Yankees were not high on the No. 3 3B prospect in all of baseball, calling him a "horrendous third baseman." 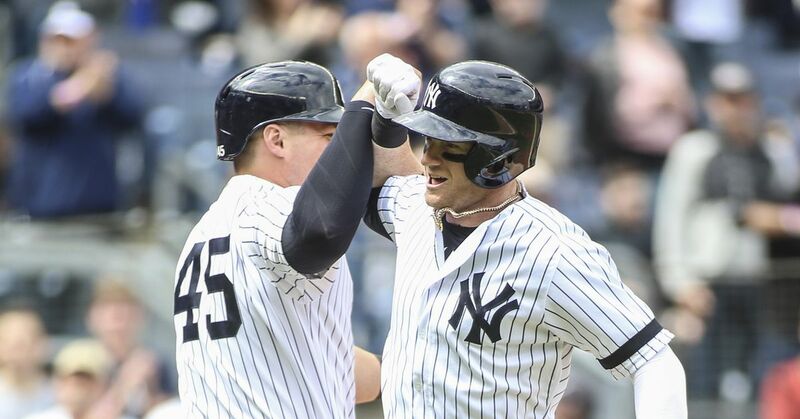 Andujar responded by hitting .319 with 15 home runs and 20 doubles in 65 games over the course of the second half of the season and helping the team make the playoffs. He is under club control through the 2023 season. As much as Andujar's bat helps New York's lineup, he is also a valuable trade chip as the team looks for starting pitching help. Mike Puma of the New York Post reported Monday that a three-way deal that would send Miami Marlins catcher J.T. Realmuto to the Mets and Noah Syndergaard to the Yankees has been discussed. It's not clear if Andujar's name has been mentioned in those talks. Andujar becomes expendable if the Yankees are able to sign Machado, who is a two-time Gold Glover at the hot corner. Even if Machado signs elsewhere, though, New York has enough power throughout its lineup where dealing Andujar for pitching may make sense.